Radio interview at DZUP during the Go Teacher Go’s September 3, 2015 episode entitled Landing on a Comet: The Rosetta Mission. Thanks to the UP Astronomical Society especially to Ms. Aya Galaroza, Ms. Trizzia Michelle Tiwaquen, and Ms. Rheanne Odessa Jimeno for serving as the program’s resource speaker. Go Teacher Go is the recipient of the 22nd KBP Golden Dove Awards Best Science and Technology Program. With a total eclipse of the moon set to occur on October 8, Go Teacher Go episode aired on October 2, 2014 covered the topic Lunar Eclipse. In the K to 12 Science curriculum, both solar and lunar eclipses are discussed as part of the Grade 7 Earth and Space Science topics. Students at this level learn about the reasons for the occurrence of eclipses and investigate local beliefs and practices associated with them. This week’s event presents a wonderful opportunity for both teachers and students to observe an actual lunar eclipse. Go Teacher Go is a teacher-on-the-air program of the UP NISMED intended for math and science teachers, aired through the official radio station of the University of the Philippines, DZUP 1602 kHz in the AM band. Ms. Malu Agad of the UP NISMED Audiovisual Group hosted the episode. I had an interview with GMA 7 on imaging planets, galaxies, and nebula using a telescope, as part of a feature on various types of photography. The segment was aired last March 2, 2014, at AHA!, a science and technology program hosted by Drew Arellano. 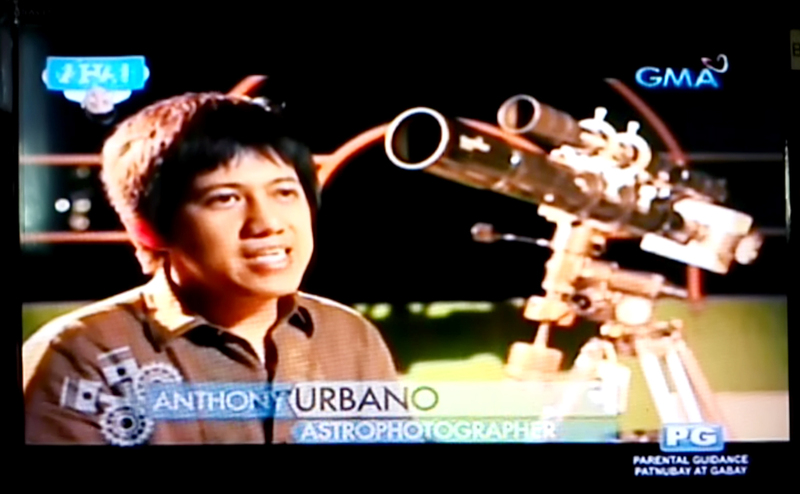 This interview with GMA 7 regarding the May 21, 2012 Partial Solar Eclipse was aired on May 21, 2012 on national television.